Don’t underestimate the power of salt! I pity people that don’t use salt in their food. Not only they wouldn’t be able to make this recipe for Fermented carrot sticks, but they’ll also lack many other flavors. At the culinary studio where I work I see people watch me. Some in surprise. Others in disgust. Some curious, willing to learn. The bravest of them ask: How much do you use? As a chef I know the secret to good food. That is salt. S.A.L.T. And fat. But let’s take it one at a time. By itself it’s already great. I mean, did you ever ate an egg without it? I know it’s only an opinion, but salt on an egg is the best invention of mankind. You only need a few roughly coarsed grains on a soft-boiled egg to feel in heaven. And the best thing: you don’t even need those fancy Maldon, Camargue or Himalaya salts. Salt on an egg. Reasons enough to worship the person who invented this – and didn’t keep it to him- or herself! Build this person a statue. Write a blogpost about it. Hallelujah! But salt can do more. Simply said: it brightens up every flavor that’s in your dish. It makes your dish taste great. As if your eating in a fancy restaurant – when you’re not such a good cook yourself. That’s because my colleagues there know the same secret. Salt. Test it tonight. When you cook. Take a bite of your dish. Add a pinch of salt. Stir it in. Taste again. I promise your taste buds will tell you I was right. Else you need to add a little bit more. How much is a pinch of salt? Great question. The answer is simple. It’s that much that is needed to improve your dish considerably. In the culinary studio where I cook for more people I use more than when I’m cooking at home. As a rule of thumb, start with what you can hold between it and the index finger. Taste. Dare to add some more. Just stop before you taste the salt itself. But .. shouldn’t we less in our salt intake? No, not if you cook your own meals. If you eat a lot of ready-to-eat either from the freezer in your supermarket or restaurants, simply stop doing so. Cook. Only then you can control the amount of salt you need. FYI the FDA about it. So let’s use some salt! Let’s make some fermented carrot sticks! Our ancestors not only gladden us with salt-on-eggs, they also found out that you use it to preserve. Since we can buy carrots everywhere at any time, we don’t need to. But fermenting is fun to do, as I am just finding out. Next to my first batch of sauerkraut I fermented some carrot sticks. And no need to worry; most of the salt remains in the water that you’ll throw away after you ate ’em all. Because that’s what you’ll do! A nice and fast recipe for a first time fermenter. 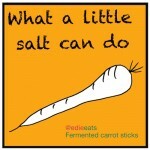 The longer you keep your carrot sticks in the brine, the saltier and softer they become. Great to eat just as a snack, but they also give that nice tangy flavor you sometimes need in a salad. Tip: As you can see, I didn’t give any amount directions. Since that depends on the size of the jar or pot you’re using. I can imagine that want to start small, just to try it. But prepare to get hooked! Sterilize your pot(s). Wash them in your dish washer and carefully pour some boiling hot water in it. If you use a glass jar, put it on a wooden cutting board or a towel to prevent from breaking the glass – in particular when it’s on your cold counter. Try to fill it to the max. In the mean time, preheat your oven at 200 F | 100 C degrees. Empty the jar and let it dry in the oven. Carefully, pot is hot! Clean and cut the carrots. Eyeball the amount of carrots you might need to fill the jar up to 1 inch | 2 cm underneath the rim. Clean the carrots with a vegetable peeler and cut them in smaller pieces. I made sticks French fries size [for the Dutch readers: onze gewone maat patat bedoel ik!]. Make the brine. For every cup | 250 ml of water take 2 tablespoons (30 gr total) sea salt. You might want to warm the water to dissolve the salt more easily, but with some patience and stirring it will dissolve as well. Fill the jar. Remove the water, put as many carrot sticks in the jar as possible. Eat any left-over sticks. Add the brine (salted water) and close the jar. Let rest and ferment on your counter for 6-10 days (preferably at 65-80 F | 18-16 C degrees). Test by tasting. Of course you use a clean fork to pick the fermented carrot sticks from the jar. Keep your sticks. Refrigerate when carrot sticks are best according to your taste. You can keep ’em for a few months in your fridge, but will get softer after a while – if you can resist them this long. Please read these instructions and tips before you start. 1. The carrots, and any other vegetable you want to ferment, need to be covered with the brine completely. If possible use a system like the Krautsource-ring I backed at Kickstarter, that has a spring and a small disc that keeps the vegetables covered. You can use a smaller (also cleaned) jar or a cabbage leaf that you fold on top of the carrots. 2. Every day, open the jar for a quick second to let the gas escape that is produced by the fermenting. Not necessary when you have a water-lock system like the Krautsource-ring. 3. Remove the cabbage leaf after the original fermenting period and keep the jar in your fridge. Note: As I’m still a rookie in fermenting, please inform me with a comment below if I tell nonsense! Energize salads with zesty wild fermented carrots.